Even with the resurgence of vinyl, the compilation 7" seems to be an entirely lost art. They were ubiquitous in the '90s, at least in the indie and punk communities. Parade of Homes isn't my favorite example of the medium, but it's still well above average. I can't really say that any one participant here is a "draw" or an "anchor" so to speak, but I know that the Barnabys had a decent following in their native Philly. Their contribution (in this instance, just singer Joey Sweeney kicking it acoustic), "Tiny Ships" is of humble bedroom aesthetics. Their Augustus Loop CD can be found used without much effort. 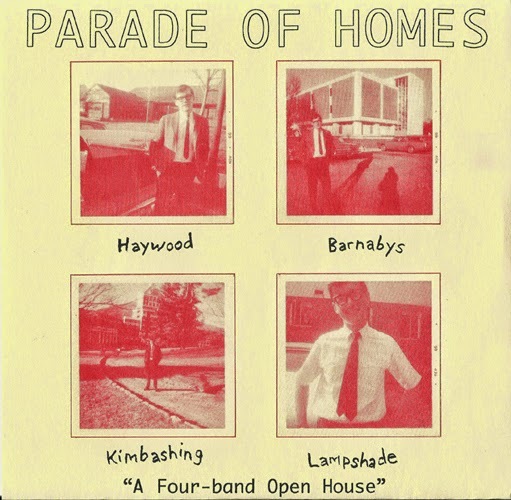 Side one is really where Parade... is at, boasting a pair of indie-guitar rock hopefuls that play for keeps. Haywood's "Devon Lanes" wields the humble self-deprecating card, while Kimbashing follow that up with "Ultra-Easy," a surging melodic maelstrom that exudes a Chapel Hill sized hook. I would have probably cast aside this San Diego trio as just another dime-a-dozen, acousti-pop also-ran were it not for mouthpiece Steve Harris who croons uncannily like Andy Sturmer of Jellyfish. 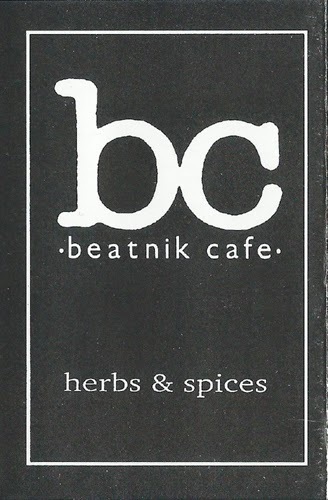 Given that Herbs... was most likely a DIY demo tape, Beatnik Cafe didn't have anywhere near the resources their relatively renown contemporaries did. Nonetheless, some of these rather economical songs were angling toward Bellybutton territory, particularly "Spanish Fly," which bears the same infectious lilt as "Baby's Coming Back." Coincidence? Compared to what I normally present on W/O, the Beatniks might ring a little too clean cut and peppy to your liking, so consider yourselves warned. I really question my judgement when I decide to post a record, particularly a full length, with only one genuinely stimulating song on it. Then again, my audience might see it quite differently, so that's what prompted me to share Penguin Fury. I know not a thing about this group, save for their lineup which is a co-ed quartet, ostensibly from the New York City area. The "stimulating" tune in question is the album opener, "And You Will Shine," a melodious, ringing power pop zinger of the highest echelon. Penguin Fury is markedly inconsistent thereafter. Maybe it's just me, but at the moment I'm hardly in the mood for jubilant, trumpet-driven rave-ups like "49 Steps" and "Stagecoach to Pluto." Conversely, a pair of thoughtful ballads, "And I Want Her" and "Quiet Falls the Rain" are too nondescript for their own good. But enough of my babbling. Draw your own conclusions at your leisure. New noise: Party Boat 7" (Jetpack) & Peg/Hand Habits split 10" (Eschatone) - A brief overview. 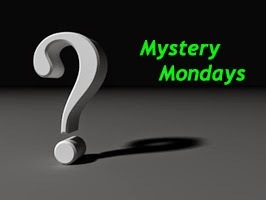 Have a couple new morsels to tell you about, the first one being a newly minted 45 from the Saratoga Springs, NY quartet, Party Boat, fronted by prime-mover Benjamin Garrett. Best Coast may have ushered "surf-pop" into prominence again, but if you're anything like me their Spector-tinged formula has evolved into a pleasant but predictable echo. Garrett and Co. have gracefully retooled that same sonic motif into something considerably less cloying and precious on "Little Fish" and "Don't Stress," both of which bear the subtle ironic flair of one of their more creative contemporaries, The Drums. This wax is the first salvo in a 7" series on Jetpack Records, limited to a mere 150 copies, and not available digitally at this time (or perhaps ever). 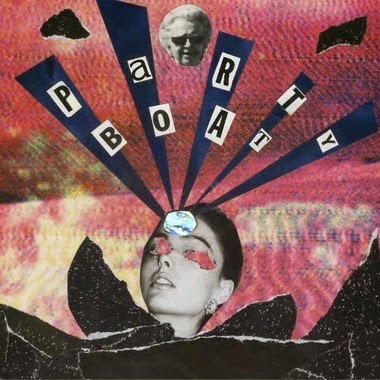 You'd be advised to order yours via Jetpack quick, fast, in a hurry, but if you require further convincing you can stream Party Boat's 2013 Losin' Cool demo via Bandcamp. Next up is a split 10" (how often do you see one of those these days?). On one side we are presented with Peg, an assumed name for Avi Buffalo drummer Sheridan Riley. Her thing is dynamics, which can commence with a delicate and hushed soliloquy, escalating to a crescendo of squalling feedback shortly thereafter (check out "Every Reason" for starters). Riley's overarching tact resembles that of singer/songwriter Laura Veirs, albeit with stronger pop tangents, particularly on "Take Too Much," vaguely tapping into the '70s romanticism of Rumors. The other side of the coin features two lengthy numbers from Albany, NY newcomers Hand Habits, a four-piece commandeered by Meg Duffy, who are not only long on content but heady atmospherics to boot. Operating in similar sonic confines as Mazzy Star and Beach House, Hand Habit's tranquil, contemplative vistas don't smother so much as caress. Clocking in at nearly ten minutes, the second selection, "Blooms" kicks off with tranquil acoustic guitar lines that blossom into a hazy billowing comedown by songs end. You can experience this blissed-out release for yourself on vinyl, available direct from Eschatone or via download. Each side is treated as it's own EP, and are sold separately via, you guessed it, Bandcamp. Go here for Peg and here for Hand Habits. From 1987. In rapt anticipation of the greatly expanded C86 compilation that's coming out in June. The name Royal Court of China might ring a bell for you fanciers of late '80s hard rock, albeit far from household moniker status. They made minor ripples with two albums for A&M, but before those came this ep, seeped in no small shortage of Americana tendencies. In fact, the commencing "The Lottery" possesses a pronounced spaghetti western tact, that's hard to discern whether it's contrived or genuine. "Take Me Down" follows suit, but by the time ...Beat'n Path's high water mark, "Forget Me Nots" kicks in on side two, RCoC ditch the hick factor almost entirely and settle on something vaguely on the same wavelength as Green On Red. A Yardbirds rendition closes this affair out. There are few if any revelations here, but I thought this might be of interest to some of you. Enjoy (or not). 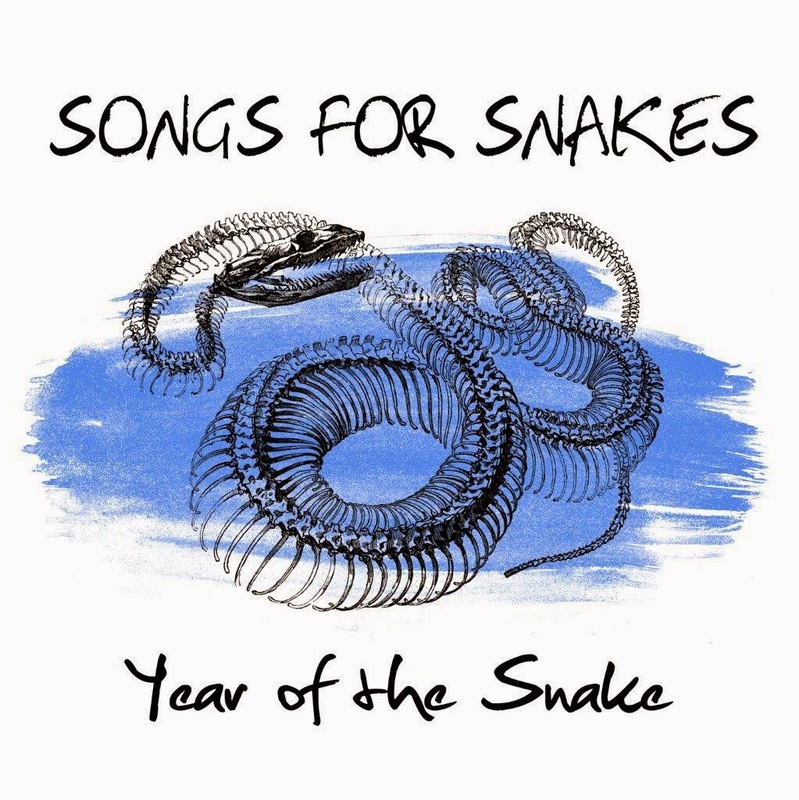 Songs For Snakes - Year of the Snake (2014) - A brief overview. To cut to the chase, most punk-pop aggregations with any integrity left aren't being courted by major labels, nor are they left a trail of crumbs the festival circuit. Suit yourself, Vans Inc., because here comes album number two from the achingly rugged and melody-ridden Songs for Snakes, a Bay Area trio who wowed me with their 2012 platter, Charcoal Heather. Still picking up where influential antecedents Jawbreaker, Sugar/Husker Du, and even Mission of Burma left off, the SFS formula hasn't been modified to any great extent on Year of the Snake, though the acoustic strains leading into "I Felt 13" make for a brief respite from the album's overarching, power-chord adherence. With riveting tuneage like "A Wave That Wants To Be a Sea" and "Painted Lawns" on full-surge display, I'll gladly take the Snakes 'holding pattern,' innovation be damned! See what I mean by checking things out on their Bandcamp page, where you can buy/stream Year of the Snake digitally, or better yet purchase on gnarly, splatter colored vinyl. Lustre - s/t LP, Kalifornia promo ep, 7"
Brainiac 5 - When Silence Was Sound 1977-80 (2014, Reckless) - A brief overview. Given the uber-arcane nature of some of the vintage goodies I make available here, it's heartening to learn that every so often one of them gets a bonafide reissue. Looking back at my hasty 2012 entry for Brainiac 5's lone LP, the posthumous World Inside, it's become apparent that I oversimplified what the Cornwall, UK troupe was all about. Luckily, the Brainiac's newly minted anthology, When Silence Was Sound, has enlightened me further and should do likewise for you. The band's late '70s lifespan in itself might suggest quite a bit, but it would take a lot more than your proverbial 140 characters to describe their essence...but I'll try. 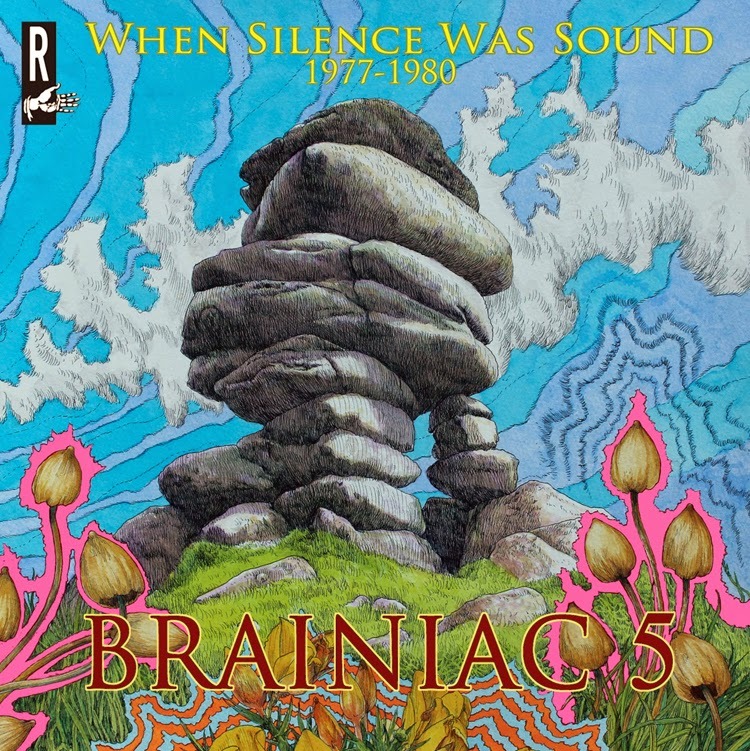 Brainiac 5 conveyed a casual mash-up of proto and post-punk, rarely hitting the famous three-chord sweet spot that slotted in between those two realms. More inspired than incendiary, the quartet might be one of the only bands of their era that weren't deliberately trying to sound like a product of it. Their brief discography hinted at the likes of the Velvets, Cleveland punk, Tom Verlaine and Nuggets, coupled with a low-to-mid fi sonic penchant, tinting just about everything in sight with a grainy mystique. When Silence Was Sound reprises all of World Inside's ten selections, though some appear in slightly altered versions. An additional seven songs are added, culled from singles, demos, and even a 1980 concert which would prove to be their last. Intentional or not, the Brainiacs were surprisingly long on diversity. The few articles I've read on them emphasize their psych proclivities, but aside from the slow-burning fuse that is "Endless River," and the Barrett-esque "Woman Inside" their modus operandi was more contemporary. In fact, "I Tried" was as forward thinking as anything their colleagues were brewing up. "Time" embraces a contemplative and practically ethereal finesse, the yin to the yang of the boisterous rocker "Addicted," which plays out like Swindle -era Pistols. "Waiting for the Woman" kicks up a Pere Ubu-like racket, while the lengthy and loopy "Feel" vaguely foreshadows what fellow Brits the Monochrome Set would have in mind shortly after Brainiac 5 hung up their collective hat. In a nutshell, When Silence is a disparate but delightful patchwork. As luck would have it the band reunited in 2012-13 for some reunion shows, and were even buoyed enough to commit some unrecorded material to tape for a new 10" ep (in extremely limited quantities I might add). Colin Hill lays out the entire Brainiac 5 saga in Silence's detailed liner notes, up to and including the reunion. Hard copy CDs can be obtained through Amazon and the band's website. You can stream it on Bandcamp, and I've also made a two song sampler available below...but just for a little while. By will alone we set our minds in motion. From 2003. Last week, this band performed this very album in it's entirety...only out of order and acoustic...but not entirely. Anyway, you can check out the original version here. I won't be telling you much about the Convictions, a quintet ostensibly from San Francisco, as there isn't a shred of relevant info to be had online. 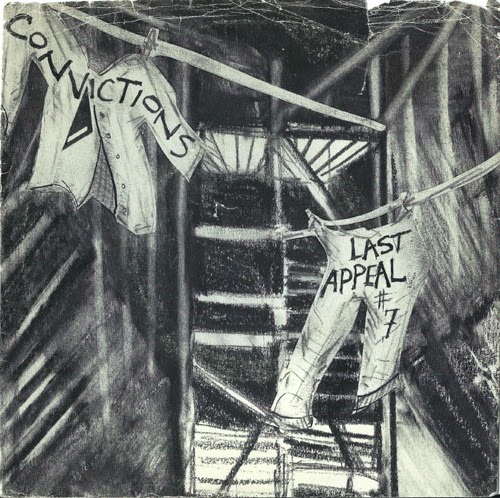 Instead, I'd be better off speaking to their songs, especially the A-side of this wax, "Last Appeal #7," a rugged pop-rocker with socially conscious sentiments that doesn't get too heavy handed. Pretty solid hook here, and by and large, the Convictions might have been a good fit for their now defunct hometown label 415 Records. The flip "Why Won't You?" mines a demonstrably more rootsy vein, laden with patent bar-rock vibes. From my end there's no telling if this was the band's only vinyl offering. I've been on something of a punk rock tear this week, and I thought this would be an apropos follow-up to the Tantrum comp I unfurled the other night. Not to be confused with the completely unrelated 1980's Flies, whose Homestead Records album was posted a few years back, these Flies took to orbit in the mid-90s in the vicinity of Spokane, WA. With a score of dizzying, two minutes salvos, the Flies speedster thrust bore an unmistakable resemblance to contemporaries Scared of Chaka. 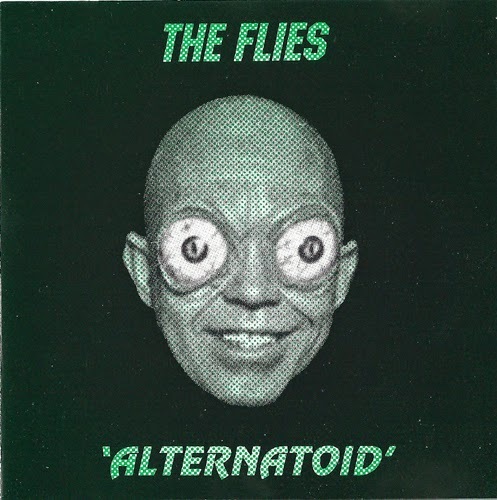 And as with the case of SoC, the Flies seemed to be taking a page from the Dickies as Alternatoid conveys a pronounced sardonic bent, albeit this trio isn't nearly as melodic. Still pretty intoxicating nonetheless. I'm damn-near downright surprised that no other sites have put this one on the table. Perhaps Tantrum's schizoid album jacket scared some folks off, but personally I regard it as something of an asset. This eighteen song platter is way more Flipside than Maximum Rock N Roll, and I wouldn't have done it the other way around in a million years. Though it's emphasis was local (L.A. and surrounding environs) Tantrum strangely epitomized where the whole alt/punk/grunge thing was headed, not long before Nirvana would push that whole ball of wax kicking and screaming into the pop stratosphere. The proceedings here aren't exclusively balls-to-the-wall punk, but if that was the draw there are some seriously hot practitioners in attendance, specifically White Flag, Wreckage, the Instigators, and Artistic Decline, not to mention like-minded acts of the female persuasion including Frightwig and the ever popular L7 who offer the instant classic, "Bite the Wax Tadpole." I Love You, who I've enthusiastically endorsed on the pages, are present with an early incarnation of a song that would later materialize on their first album, in all it's fuzzy, wha-wah'ed glory. Pat Ruthenmmear and his Death Folk will kill two glorious minutes for you, Spiderbaby weave a chiming and chilly goth-punk tapestry in the guise of "Wake Up," while the Groovie Ghoulies update a certain Men Without Hats standard. And if there was any band on Tantrum that perfectly dovetailed with the aforementioned record sleeve (in all it's glorious, bonkers abandon) the award would certainly go to Celebrity Skin, whose "Radiation Man" is about as avant as most of you would ever care to get. Speech be my shovel, dig to see what's in her eyes. 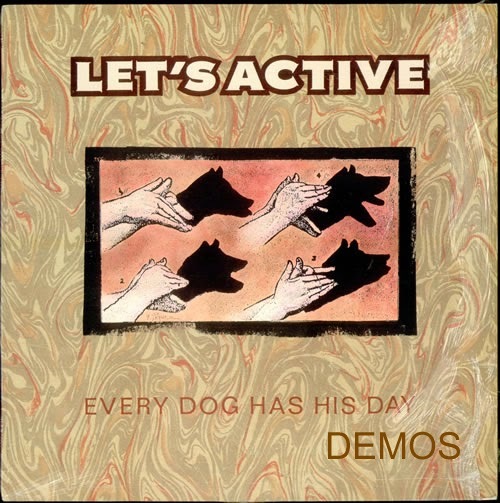 The stellar 1988 debut from a D.C. outfit who were responsible for some of the most creative, melodic pop-punk ever. Also included is the contents of an earlier ep. Among several songs here that would make the final cut for Every Dog, there's some surprisingly strong material that didn't including "You're a Comet," "I Wonder" and "All Roads Lead to Hell." While they don't consistently mesh with Let's Active janglier aesthetic of yore, they don't fail to impress either. When it comes to Mitch, one rarely goes wrong. Enjoy. 14. She Loves the T.V. With a name like Spaghetti Western it has to be twangy...right? Amazingly, you won't find a speck of cowpunk bravado anywhere on what appears to be the Western's lone platter. The C&W attributes that occasionally crop on Spaghetti Western are relatively tame - as is the overarching modus operandi of the Jon Bertini-fronted trio itself. Skewing more in the direction of the first two Marshall Crenshaw records (and even more sparingly along the lines of the Rain Parade and Grapes of Wrath) than anything else, SW's homey Americana bent is to their advantage, not their detriment. And the real kicker? This thing came out on Epitaph Records of all labels! Heck, Bad Religion guitarist/main man Brett Gurewitz even co-produced the friggin' record, just a couple years before Suffer would set the world afire for Christsakes! Doesn't get much more unlikely than that folks. Another blog did a nice piece on this record, offering a decent backgrounder from what I recall, but it has apparently been stricken from the internet. I hope I did this justice. 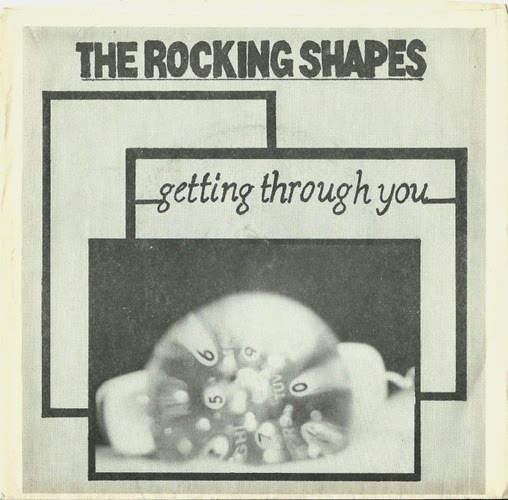 Cozy but artful FM-radio pop from 1982, with it's fair share of new-wavish tweaks. Only learned of them two years ago and have been hooked ever since. First encountered Blue Movie by way of The View From Here compilation and really didn't give them a second thought until I found their debut (this album) in a really swell dollar bin a few weeks ago. This San Francisco treat was a trio by all accounts, and had an ear for what was going on at the time without getting too subterranean. You might hear strains of period R.E.M. on "Trouble in the Yard" and "Reading D.C." "Mary and Riley" follows the band's bluegrass muse, while a notably more measured guitar-pop motif occupies "Quiet Conversations" and "Single Earring," foreshadowing what Toad the Wet Sprocket and Gin Blossoms would deliver to the masses in a few years time. 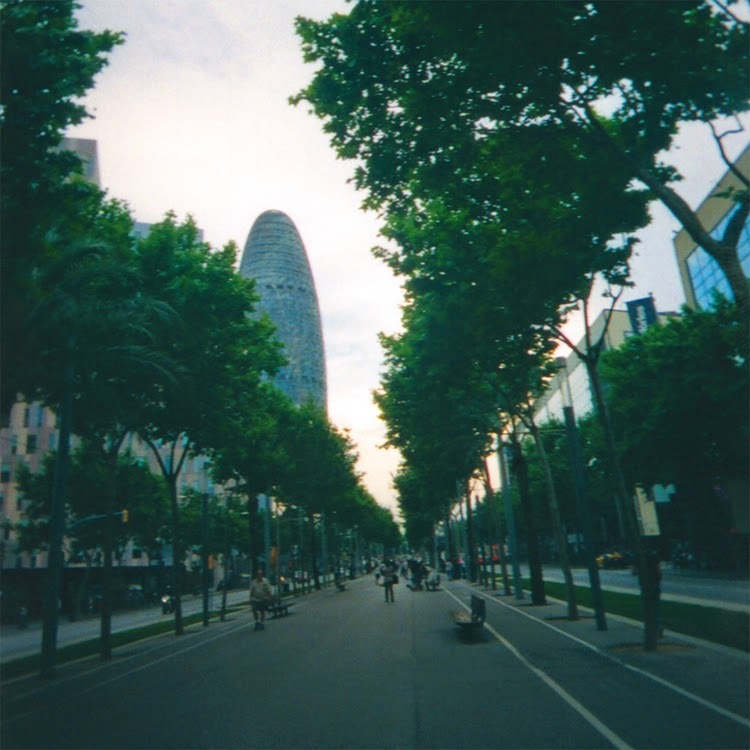 Hearts in Clubs peaks at the start of side two, with the jangly and propulsive title cut. Good record, so just download it already. Eat your peas.